If you are a heavy phone user and like to multitask a lot on your Samsung devices, then MultiStar if for you. MultiStar is a newly introduced plugin or addon for Good Lock 2018. This new plugin opens several new multi tasking options. You can launch and use several apps at the same time using Multi Window + feature. 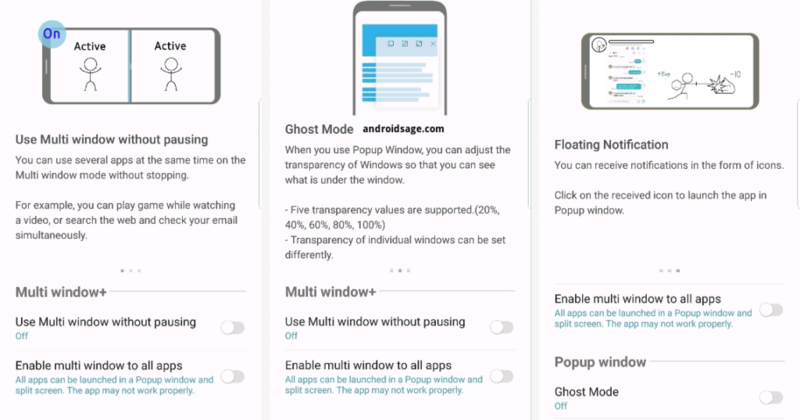 Popup Window is another feature that lets you launch apps in popup window (advanced split screen) and adjust the transparency as well. More features are listed below. Also, download MultiStar APK from below. However, the plugin is targeted towards Android 8.1 Oreo or later based on Samsung Experience 9.5. This means it can only work on the Samsung Galaxy Note 9 for now. This makes sense because multi tasking is a heavy activity and uses lots of CPU resources, RAM, battery, etc. You may also try MultiStar on the Samsung Experience 10 for Galaxy S9 and S9 Plus based on Android 9 Pie. Multi window+: You can use several apps at the same time on the Multi window mode without stopping. For instance, you can play game while watching a video, or search the web and check your email simultaneously. Popup window: All apps can be launched in a Popup window and split screen. Floating Notification: You can receive notifications in the form of icons. Click on the received icon to launch the app in Popup window. There are several methods you can use to download the MultiStar plugin from Good Lock 2018. If you have an eligible Samsung Galaxy device, you can directly download the MultiStar from Galaxy App Store. Simply launch the Good Lock 2018 app and you will see a listing of MultiStar there. Alternatively, you can visit the MultiStar listing from Galaxy App store. For MultiStar to work, you will need Good Lock 2018 APK as well. If Good Lock 2018 is not yet available in your region like France and other parts of Europe, then you can download the APK from below and install it directly. As Good Lock is area restricted, you will see blank when you open Good Lock. So you can visit our original post about Good Lock 2018 installation tutorial to see how to setup for beginners. Additionally, you can also use Bad Lock as an alternative.